Drawing on his background in natural sciences and his enthusiasm for natural materials, Dr. Gentry begins the jewelry making process with a walk, a sketch and often times an inspiration from found stones near his home in the Pacific Northwest. After cutting the stones to find their inner beauty, Gentry polishes each stone and then transforms them into unique, hand-crafted, wearable pieces. 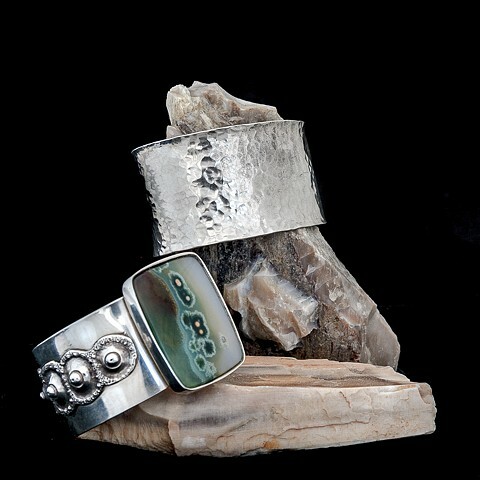 Natural stones shells and beads are often mixed with cast or hand formed silver, gold and leather. His studies of geology, paleontology and metal arts influence his work as well as the historical Mexican designs of Hector Aquilar and William Sprattling. Contemporary influences include Dieter Lorenz and Patric Murphy. He is interested in participating in gallery shows and accepts commissions.